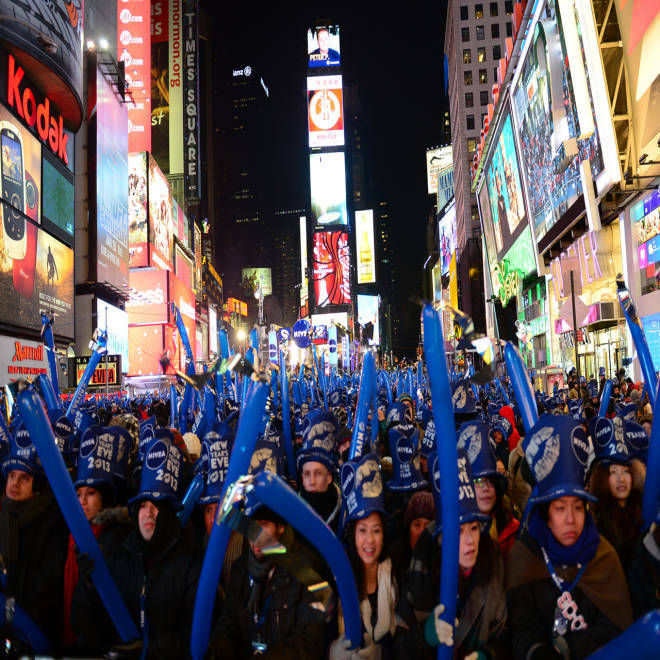 More than a million people convene at Times Square, where a ball is dropped at midnight at the start of a new year. Millions more watch the festivities on television. As the blinking Waterford crystal ball dropped over Times Square at midnight, ushering in the new year, a peach dropped in Atlanta and an 80-pound MoonPie prepared to drop in Mobile, Ala. Noisemakers sounded, kissers kissed and those who knew the words sang, “Auld Lang Syne” and Frank Sinatra's version of "New York, New York." Come morning, a brave few will strip down to their skivvies and run into nearby oceans and lakes for an invigorating polar bear dip. This, they say, in the name of resolution and renewal. Happy New Year, America. Welcome to 2013. The new year is also a time of anticipation. In Washington, D.C., this year, thousands lined up at the National Archives to honor the 150th anniversary of the Emancipation Proclamation, the order signed by President Abraham Lincoln which declared an end to slavery. It went into effect on Jan. 1, 1863. Traditionally, black churches have held Watch Night services, according to TheLeafChronicle.com, a nod to the night when slaves waited to hear the order had gone into effect. That night in churches across the South, Lincoln’s words were read aloud. New Year's Day marks the 150 anniversary of the Emancipation Proclamation – when President Lincoln sign an order that broke the back of the slave trade. NBC's Ron Mott reports. Tradition is often marked with food, and in the South, a place of tradition in general, black-eyed peas, rice and ham hocks are cooked together to produce a deliciously salty combination. Sometimes, according to a New York Times story from 1987, greens – representing money -- are added to the mix. The black-eyed peas represent coins. Champagne is a given, usually accompanied by a pop, suds and a toast. Toasts are a “verbal souvenir,” npr.org says: "It's something you take home with you as sort of a remembrance of that time." The festivities in Times Square started in 1904 as a huge street party held by the owners of The New York Times who wanted to celebrate the opening of their new building on 42nd Street, according to the Huffington Post. The Huffington Post also tells us that the Times Square ball drop, now a symbol of its own, was a nod to another tradition – the Royal Observatory in England would drop a ball every day at 1 p.m. so that ship captains and others in the region could synchronize time. Happy New Year! New York's Times Square prepares for midnight revelries as more than a million people began to pack the country's biggest block party. NBC's Ron Mott reports. If you hear people singing – or mumbling, more likely -- "Auld Lang Syne," know that it was written by the Scottish poet Robert Burns in 1796 who heard it sung by an old man near where he grew up. Here are the words if you want to impress at a party. Other traditions across the country include the Rose Parade in Pasadena, Calif., which began in 1890 to promote the city as “the Mediterranean of the West.” It has since been folded into the festivities surrounding the Rose Bowl football game. Mobile, Ala. continues a now five-year-old tradition with an 80-pound MoonPie that was delivered in a huge box to the Mobile Convention Center, according to local15tv.com. That’s 45,000 calories of Moon Pie. There are other, less boisterous traditions. Faithful Catholics attend a New Year’s Eve mass in honor of Mary, the mother of Jesus. And in Boston, 1,000 artists gather for First Night Festival of the Arts, a tradition started in 1976. The event, which showcases 200 performances, attracts more than a million revelers from throughout the region. 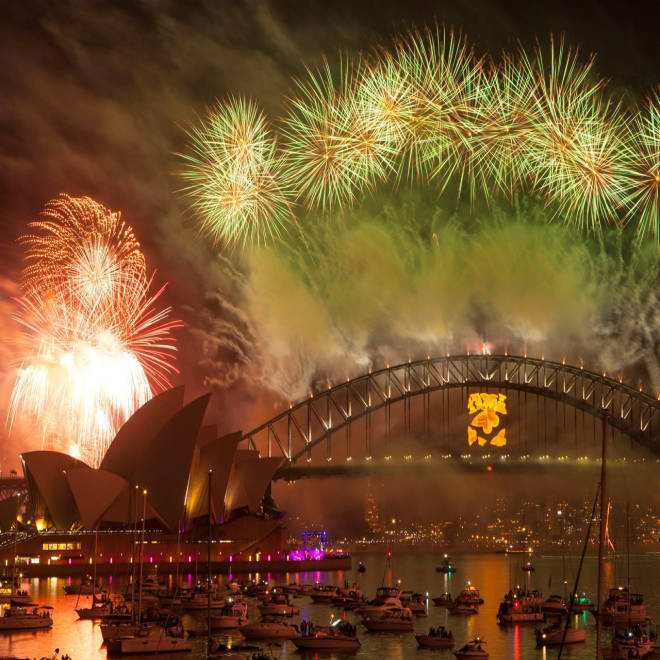 From Sydney to Siberia, revelers celebrate the arrival of a new year.